...I managed an early morning run, a truncated version of the Seaford Head route, though the climb on the short version is more intense. It was cloudy. Juneathon total: 54.92 miles, 11 days out of a possible, nay, required, 30. So I do not expect to win any of the covetable objects Jogblog is going to distribute to the winners. I ignored this wise advice from Proverbs 23:31 last night at the Newhaven and Seaford Sailing Club midsummer party and had to leave the car there and walk home, so this morning I ran from home to Splash Point, all the length of the front to Newhaven east pier, and back to the club to collect my car. Though hot, I have run in hotter conditions. Also this week I managed two conference runs while in Exeter and had the pleasure of the company of a fellow delegates on each morning. I wish I had been able to lead them better; my intention was to run along the banks of the river, but finding the river from the university is not as easy as it might seem. I also swam in the sea yesterday, for a good fifteen minutes. It is considerably warmer. I shall go in again this afternoon. Juneathon total: 52.48 miles, 10 days out of a possible 27. I ran yesterday and today and, while Monday to Friday showed a total lack of exertion of any sort, next week I'm at a conference and have already used the conference hashtag #exeter10 to gather a critical mass of runners, three of us, who have committed ourselves to bring our kit. Yesterday was the usual Seaford Head route. Today I went inland, to High and Over and round, to return by the Blatchington golf club. I met cats hunting, nervous dogs cowering and lost ramblers asking me the way. I'm going for a sea swim in a moment which I shall add when I get back. And one sea swim of around 6 or 7 minutes duration. This isn't very good. At the end of this post I offer my Juneathon activity so far and, with the exception of two Roman runs in the first week, it takes place entirely at weekends. The best I can offer for weekdays is that I've thought very hard about it. So on Saturday I ran three miles or so on the familiar Seaford Head route; on Sunday I managed five and a bit miles, along Seaford front, but then turning inland at Tidemills, the ruins of a what was once a mill, hospital and sea-plane base, and returned home along the main road. I also tried to make up for my poor show so far by adding a sea swim, of about six or seven minutes. Unlike the Norfolk beaches of my childhood, the sea off Seaford beach deepens quickly. There is none of the walking for miles and miles only to find the sea still at knee height that I remember at places like Holkham. Here a few steps take the swimmer up to his chest, and, having launched, a few strokes out of his depth. The beach is shingle, and its steepness can make getting in and out difficult if there is much surf. This was not my first sea swim of the year, but the cold still shocked me, and my extremities became numb. I acclimatised and swam parallel to the shore, trying to count my strokes to keep a tally of the distance. After what must have been six or seven minutes I got out, onto the nearly deserted beach. As I dressed another swimmer, wet-suited, swam more powerfully out to sea. I hope a hot half-marathon will make up for my lack of application to Juneathon so far. It was, fortunately, a little cooler than Saturday, the previous day, and when we assembled at the start on the front, Seaford Head was invisible in mist. For this, the seventh time I have entered this race, I was under-prepared. Training had been sporadic, mostly limited to weekends, and over shorter distances than I would have liked. And it was probably a mistake to follow the red wine at dinner the night before with other, more potent, liquors. However, two runs in Rome the previous week gave me something of a base. I was also cheered by the unexpected presence of a Swedish friend at the start, who had come to support her brother; visiting for the weekend from Gothenburg, he had decided on the spur of the moment to run a half-marathon. After the start on the front, the race set off to Bishopstone village. I had the opportunity to marvel at my fellow runners' varying ideas of appropriate race clothing for a hot June day. One young man wore a waterproof top and covered his head with a wooly hat, apparel better suited to a chilly January run. At the first hill I resolved that I was going to walk up each hill. In fitter, faster days I have run up the inclines, but this year I was conscious of my limitations. The longest hill comes early on, a mile or more of hard climbing along the Greenway to the tops of the downs east of Bo Peep. It's a long time since I ventured up here, something I must rectify. When I lived nearer the path from Seaford to Bo Peep, this area was the starting point for most of my training runs. Then we ran a mile or so along the top of the downs, before the descent into Alfriston, and the road crossing, ably marshalled by the doyens of Seaford running, Bill and Glynis Young. 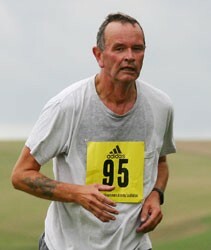 The race then headed seawards along the banks of the Cuckmere on dry rutted paths, and over many a stile. This section can be tedious but I was lucky enough to fall in with a couple who had come all the way from Leicester to take part, and their company helped the time go. Before I knew it I was at the Golden Galleon. Here the last ascent took us up Seaford Head and then along the cliffs before plunging down to the final stretch along the front. I had nothing left for a sprint finish, and hobbled over the line in 2:33.02. This represents a poor time, my worst for the distance, and I felt distinctly weak afterwards. Nevertheless, I finished, and can come back for another attempt another year, when commitments may make training more possible. The views are splendid, the marshals cheery and helpful and the photographers from Sussex Sport Photography now know me by name. I came across this old photograph, taken by my then-girlfriend after I'd been for a run round Clissold Park. The t-shirt dates it well: it must have been taken during the printworkers' dispute with Murdoch. 3rd June: another run round Rome, with a little more distance. This time I found the Parco di Traiano, ran round the Colosseum and past the Domus Aurea. 4th June: a five minute sea-swim. The sea was still cold, though air temperatures were very high.